The passing of Ronnie Montrose hit hard, in particular the heavy music community, which banded together the original lineups of MONTROSE and GAMMA plus scores of other guests to pay homage to Mr. Bad Motor Scooter himself. On April 27, 2012 at the Regency Ballroom in San Francisco, Ronnie Montrose acolytes and friends held a tribute concert which saw the likes of Sammy Hagar, Neil Schon, Joe Satriani, one half of KISS, the members of TESLA, Eric Martin from MR. BIG and longtime Ronnie Montrose collaborators Ed Roth, Ricky Phillips and Denny Carmassi. "Concert for Ronnie Montrose" is a celebratory, sometimes spiritual journey through Ronnie's career spanning his work in the MONTROSE band, GAMMA, THE EDGAR WINTER BAND and his solo material. Neil Schon, who reunites with former JOURNEY (and MONTROSE) drummer Steve Smith, opens the show with scorching chops you'll rarely hear in his home base, starting with "Overture", then the title track from Ronnie Montrose's "Open Fire" album. Schon's set is concluded with a molten interpretation of Ronnie's take of Gene Pitney's "Town Without Pity". Joined by Ed Roth and current STYX bassist Ricky Phillips (also Schon's former bandmate in BAD ENGLISH), the union is magical as Schon leads his team with constant head nods, creating tremendous energy to kick off the show. The next grouping of Frank Hannon from TESLA plus later-era MONTROSE affiliates Dan McNay, Randy Scoles and Steve Brown do a fair shake of "I Don't Want It". TESLA comes together as a band for "Little Suzi", which finds Jeff Keith hanging in there with his arm in a sling and his vocals a little chokier than usual. At least Keith serves the reminder that "We're here to share the love." Next comes Tommy Thayer and Eric Singer from KISS, along with Ricky Phillips, Keith St. John (one-time MONTROSE singer) and Eric Martin, who whip a bluesy and funky take on "One Thing On My Mind", as Amber Morris and April Grisman provide backing vocals. Thayer, Martin, Phillips, Morris and Grisman stand by for a change-up that includes Frank Hannon and his TESLA comrade Troy Luccketta, plus Ed Roth for a cover of THE EDGAR WINTER GROUP's "Free Ride". The Winter era of Ronnie Montrose's career is given a monster treatment as Phillips, Hannon, Roth and Luccketta are joined by Tal Morris (CREEDANCE CLEARWATER REVIVAL and Ronnie Montrose associate), Jimmy Paxson from the Stanley Clarke band and Jeff Watson (NIGHT RANGER) for a beefy rendition of "Frankenstein". Hannon, Watson and Morris play air-tight guitar lines then respectfully trade off portions of the climactic guitar solo. Meanwhile, Luccketta and Paxson are equally terrific as a linear drumming duo. The marquee moment of this show is the reunion of Sammy Hagar, Denny Carmassi and Bill Church, constituting the surviving members of MONTROSE's debut lineup with Joe Satriani filling in. Yet the night was stolen by Marc Bonilla in Ronnie's stead for a six-song GAMMA set. Fellow Bay Area axemen Satriani and Bonilla garnish much of the attention in this concert along with Neil Schon. Satriani, who jokes about Ronnie Montrose (paraphrasing) breaking up his bands as they were about to get big, does a solid job fielding "Rock the Nation" and "Space Station No. 5". Satriani is reverential and methodic onstage in substantiating his claim that Montrose provided him a blueprint on how to conduct a career as a guitar soloist. His performance with the MONTROSE band is mostly on the dime, while Sammy Hagar does jumping jacks and, ever the would-be life of the party, relishes the opportunity to kick out the jams with Satch and his old mates. By contrast, Marc Bonilla, who has played with Ronnie in the past along with Keith Emerson, David Coverdale, Glenn Hughes and currently CALIFORNIA TRANSIT AUTHORITY (featuring ex-members of the funk-rock years of CHICAGO), turns in a gallant, expressive and often poignant performance with GAMMA. Together with Glenn Letsch, Denny Carmassi, Davey Pattison and Tom Suczek, the GAMMA songs are the best of the entire show, those being "Thunder and Lightning", "Razor King", "No Tears", "Ready for Action", "Fight to the Finish" and "Voyager". Bonilla does such a tremendous job replicating Montrose with genuine soul, it's beautiful to watch Pattison and the GAMMA guys split the bottom halves of the faces with appreciative, giddy smiles. It doesn't hurt their jovial mood that the audience well-knows their material. In-between is a touching acoustic-piano-percussion interlude featuring C.J. Hutchins, Ed Roth and Jimmy Paxson fielding the nostalgic "Lighthouse" from Ronnie's "Bearings" album (which Hutchins made an appearance on) plus "One and a Half". Next to Marc Bonilla and Neil Schon's electrifying sets, Hutchins' sweet remembrance of Ronnie Montrose is one of the most emotional moments of the show. 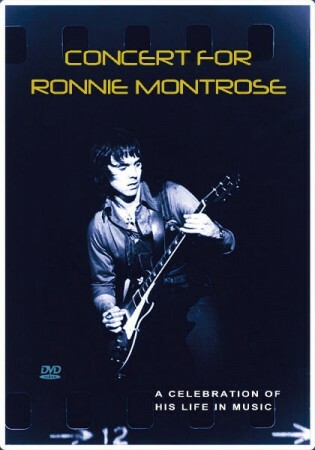 On the bonus DVD are still photos and a jam session of Montrose's songs performed by Dave Meniketti (Y&T), Mario Cipollina (ex-HUEY LEWIS AND THE NEWS), Tal Morris and famed pianist Chuck Terpo, who has worked with the likes of everyone from JOURNEY to THE EAGLES to GREEN DAY. Of these tunes recorded at Bob Weir's TRI Studios, you'll get "Rock Candy", "Connection", "Good Rockin' Tonight" and others. Finally, there's a "Kind Words" section featuring well-wishes and farewells from Ronnie's widow Leighsa Montrose plus Mike Bordin, Ted Nugent, KISS, Bruce Kulick, Gary Hoey, Derek St. Holmes, Sandy Gennaro from the PAT TRAVERS BAND and more. As far as tribute concerts go, this one has a few moments where it's a little flat, but the intent is what matters and when the performers hit their strides, "Concert for Ronnie Montrose" is as good as it gets. Guitar heads especially won't soon forget this one.